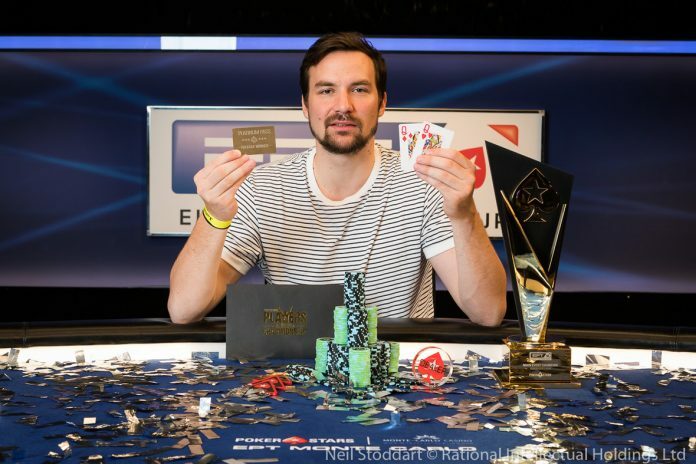 Nicolas Dumont beat a star-studded final table to win his first major title at the EPT Monte Carlo Main Event (PokerStars photo). The European Poker Tour‘s return to Monte Carlo certainly didn’t disappoint and as the Main Event final table wrapped up on Friday, there were two former GPI #1-ranked players and Hungarian Cinderella that had almost everybody cheering for him. In the end though it was France’s Nicolas Dumont who outlasted them all to win his first major title, over €700,000 and a Platinum Pass worth $30,000. Ole Schemion was once in full control of this tournament, but late Thursday things went awry for the German and he started the final table eighth in chips. He lasted exactly one hand on Friday. David Peters opened to 225,000 from UTG+2, Patrik Antonius called from the cutoff and Schemion moved all in from the button for 1,160,000. Peters folded but Antonius both called and showed while Schemion turned over . The board ran out to give Antonius to pair and eliminate Schemion in eighth place. Just over 30 minutes later a blind-vs-blind battle. Javier Fernandez, down to just 12 big blinds, moved all in from the small blind and Tomas Jozonis defended from the big. Fernandez turned over but got bad news wehen Jozonis showed . The flop gave Fernandez some hope but neither the turn or river was any help and he was out in seventh place. Antonius was arguably the biggest name at the final table. Having already won an EPT title once in his career, Antonius is more known for his high stakes cash game action now. Unfortunately, the Finn was unable to add another major tournament title to his resume. Antonius moved all in for 1,305,000 from the button and Dumont called from the small blind. Antonius showed and Dumont showed . The board ran out to eliminate Antonius in sixth. While Antonius was one of the big names at the final table, he wasn’t the one stealing all the headlines in the lead up to the final table. Krisztian Gyorgyi, who qualified for this event in a €5 spin-n-go, had won the hearts and minds of viewers at home with a bluff on the livestream. Unfortunately, that moment didn’t lead to a better one on Friday for the Hungarian. Gyorgyi raised to 280,000 from UTG, Dumont called from middle position before Honglin Jiang moved all-in from the button. Gyorgyi used one time extension before calling all in and Dumont folded. Gyorgyi turned over and found himself racing against Jiang’s . That race all but ended after the flop and then ended for good after the turn. The hit the river, making Gyorgyi’s fifth place elimination official. It took an hour for another elimination to happen. Jozonis raised to 325,000 from UTG and Peters movedall in for 2,325,000 from the button. The blinds both folded and Jozonis called and turned over . Peters grimaced after revealing . The flop kept Jozonis ahead as did the turn and river and Peters was eliminated in fourth. Even though he picked up Peters’ chip, Jozonis only stuck around another 30 minutes. Down to just 12 big blinds, the #1-ranked online poker player in Lithuania moved all in from the button and was called by Jiang in the big blind. Jozonis turned over and found himself dominated by Jiang’s . The flop made things ever worse for Jozonis and he was eliminated in third after the and completed the board. Jiang started heads up with 57.8% of the chips in play but over the next 90 minutes, all of that went away. On the final hand of the night, Dumont limped, Jiang raised to 650,000, and Dumont responded by re-raising to 2,200,000. Jiang continued the aggression, moving all in fro 10,075,000 total and Dumont called instantly. Jiang showed and Dumont happily showed [d] . There was no bad beat in the runout and Dumont eliminated Jiang to win his first major title and €712,000.